Club One Seven Chiang Mai - Gay Guesthouse, Sauna, Gym, Spa. Located on the banks of the Ping River, 1km from the city centre, is one of Chiang Mai’s hidden secrets. This 130 year old newly refurbished teak wood guesthouse is off the usual tourist track. 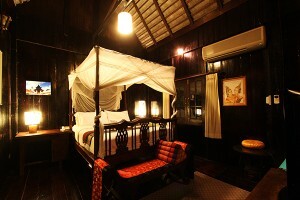 It is ideally positioned as a refuge and a base from which to discover the riches of Northern Thailand. Club One Seven Chiang Mai is the newest gay facility extending out of One Seven Singapore and Club One Seven Phuket. Club One Seven Chiang Mai is not only a gay guesthouse but it is also a gay sauna with a unique swimming pool as well as a gay gym, cafe and recently added massage salon. After a day of visiting the sites you can spend the evening meeting new friends in our sauna facility, enjoy dinner by the Ping River and swimming in the pool. You can also have a relaxing massage by one of our skilled masseurs in the privacy of our new massage salon. You don’t have to miss out on your gym routine as we have a fully equipped gym with friendly local members to work out with along side of you. Our gay guesthouse has 11 different air conditioned rooms in our 2 story traditional Thai teak guesthouse. It is not your usual gay hotel. It is a real Thai experience. You are guaranteed a totally unique vacation with the opportunity to meet friends from not only Thailand but from all over the world in your “Home Away From Home”, Club One Seven Chiang Mai.